Outside of The Lagoon, The Chimney and The Cathedral, there are a handful of other dive sites at Koh Haa, many of which are just extensions, or outer reef areas, of the aforementioned three main dive sites here at Koh Haa. They can be separated into four lesser groups, each around the main islands in this wonderful little archipelago. Whale Shark (Rhincodon Typus) Photo by Emmy AhlénAround Koh Haa 1 (Koh Haa Neung / Neau), which is the northernmost of the Koh Haa Islands, there is of in course The Chimney which has its entrances on the southern face of the island. However, for those not experienced enough to dive in The Chimney, or for those who want something more regular or with more sunlight, there are a couple of other great diving spots around this uninhabited little island. On its northern face is what some call ‘Far Away Reef.’ This is a very small diving site, and some may include it as the beginning or end of a dive at another site, but there are those who are able and happy to spend up to an hour out here. Being exposed to the open sea, Far Away Reef has both advantages and disadvantages. The disadvantages are that it usually experiences more severe sea conditions, such as waves and currents, than the more protected dive sites in this area. However, this small drawback is usually more than made up for by the more exciting marine life that lives out here. Moray Eel (Gymnothorax) Photo by Emmy AhlénWhile some divers at Koh Haa come to see the smaller and more colourful species of fish and invertebrates or enjoy the swimthroughs and cavern systems, there are those who like to hang around in slightly deeper and more exposed waters in the hope of spotting a shark, ray or larger pelagic species. Far Away Reef is one of the best spots at Koh Haa to do this. The corals and fish which live among them are healthy due to benefitting from the nutrient-rich currents which strike here first. 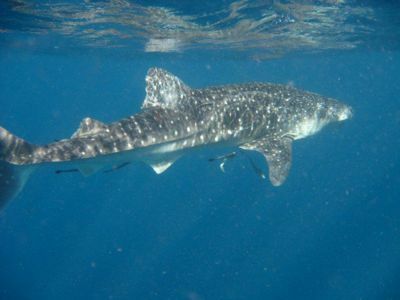 The dive site may be small, but whoever is lucky enough to enjoy a shark sighting or see one of the filter-feeding giants which sometimes pass by, they will have lots of time and air in their tanks to make the most of it. Whale Sharks (Rhincodon typus) and Manta Rays (Manta alfredi) aren’t seen every day, but if they’re going to be spotted at Koh Haa, the outer reef dive sites, such as Far away Reef, are the most likely spots. The other mini dive site at Island 1 is The Wall, so named because of its topography. This dive site is at the southeast corner of Island 1 and is basically a wall of the limestone islet that is home to The Chimney. 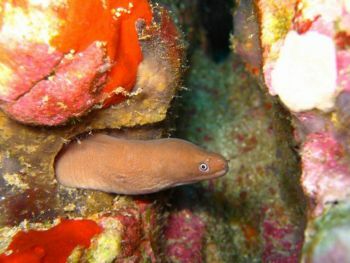 Depending on currents and the level of the divers in the group, it is often dived immediately before or after The Chimney on the same dive, but can be a dive site on its own, as well. Also exposed to a lot of open sea, The Wall is home to a lot of healthy and diverse marine life. It’s almost vertical in places and drops down to around 20 metres. Moray Eels (Gymnothorax) are among the more interesting creatures seen here. There are lots of schooling pelagic fish, such as Barracuda (Sphyraena) and occasional sightings of sea turtles. Like Far Away Reef, there’s a small chance of something very large swimming past, and from time to time these gentle giants hang around for a while. If there’s a current here, there is also some shelter from the island and the dive can easily be changed to go west across the southern face of Island 1 for even more protection.